TOP DOG 1948-P! BLINDING LUSTER! A blindingly beautiful blazer! Blast-white and lustrous, this first-year Franklin sports ZERO haze, a feature that its siblings are known for. 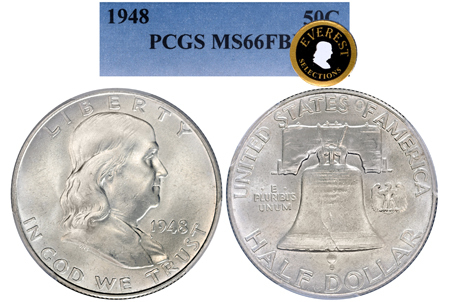 1948-P’s are famous for their solid, well struck look with clean and perfect details throughout the obverse and reverse devices. That means full, strong, and unbroken bell lines that are clear as day! Free of practically ANY bag marks and hairlines, nothing disturbs the beauty of this fine example. Shimmering, lustrous, well-defined details equal HOT eye-appeal! There is the slightest even golden hue on this beauty.